Is there a way to convert a char to its ASCII value in assembly? Write a program in assembly to read string of ASCII characters save it into memory, then extract the hex digits and convert them to integers before processing and skip any none hexadecimal characters. Use assembly instructions to branch to functions and pass the argument to the functions and receive the result in the register. Note: A is the array of integer values calculated by your summation and factorial functions. Write the calculated integer values from the sorted array to the second output file. The integers must be sorted in an ascending order. Note: 1. Each subroutine/function must have comment block in the beginning which explains which variables are the inputs that are received from caller and where they are located, and what is (are) the function’s output(s), where it is located, and how its returned to the caller. 2. Utilize the stack for passing parameters. If disable hardware interrupts (comment off line 37), the code in lines 38~40 will keep calling procedure task0 and task1 in turn which print letter C and S separately(print the full screen and start from the upper left corner to print again). Problem is once enable interrupts (line 37), and comment off lines 38~40, program does not alternatively switch from task0 to task1. It only prints a letter S and probably with flashing time by time. Code is in the boot sector (the first 512 bytes). Problem should be in one of the following: Lines 20-21 set the handler to IVT table at the 8th handler location; Lines 23-30 set timer 8293; Lines 77-92 is the timer interrupt handler. Program expected to print letter C and S alternatively. As every time the timer handler runs, it check the current task if it's task0 which prints C, it switch to task 1 which prints S, vice versa. Actual: Only one letter printed with screen flashing. I run the following program in the 8085 simulator and when it hits address 0016 ANI F0 does not work properly. Is it a bug or I am missing something? I am new to ARMv7 assembly programming (using the stm32-L476G) and I am lost on how to produce a specific-pitched sound (e.g 110 hz) to play for 15 seconds. I have done my research and reached a dead end. Can anybody help me? 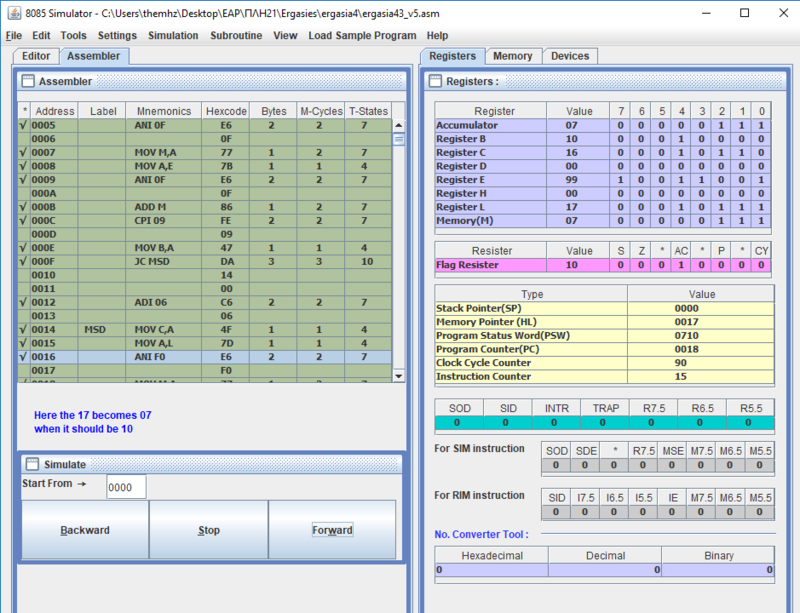 I have written a simple IO interrupt routine to test IO pin in ARM cortex m4 (cm408F). Code is below and very simple and populates vector table (also includes pragma weak and other stuff). I force the interrupt by setting the corresponding bits in NVIC_ISER0 and NVIC_ISPR0. The moment interrupt is issued the processor gives me the following hardfault exception and get stuck in a loop in L1 boot ROM.